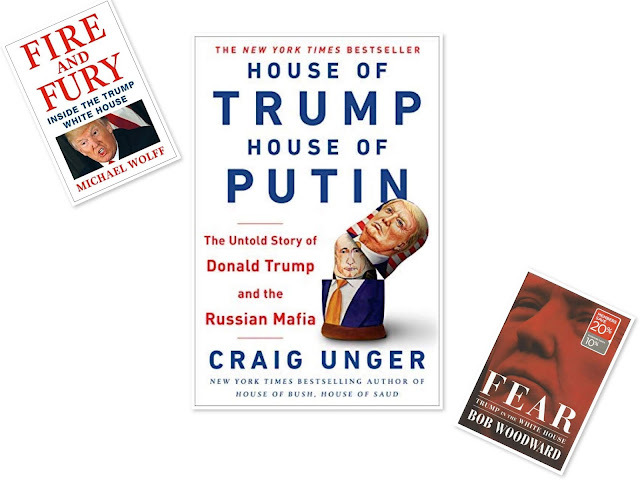 House of Trump, House of Putin: The Untold Story of Donald Trump and the Russian Mafia by Craig Unger is the second of three books about Donald Trump that I have acquired this year. It is a hard read in that the author is methodical in investigating and tracing forty years of Donald Trump's business relationships with the Russians, many of whom are members of the Russian Mafia. "Dear friends, respected colleagues!" Nikonov said. "Three minutes ago Hillary Clinton admitted her defeat in US presidential elections and a second ago Trump started his speech as an elected president of the United States of America and I congratulate you on this." If that isn't an acknowledgement of Russian interference in our elections, I don't know what is. Ten days before his inauguration, Donald Trump tweeted, "Russia has never tried to use leverage over me. I HAVE NOTHING TO DO WITH RUSSIA - NO DEALS, NO LOANS, NO NOTHING!" That Trump allowed his Trump-branded real estate to be used by the Russians for money laundering. That Trump was $4 billion in debt when Russian money bailed him out, revived his business career, and helped launch his venture into politics. That Trump provided a home in Trump Tower for members of the Russian Mafia and that they worked out of Trump Tower. That Trump was the subject of one or more Soviet intelligence operations that likely produced kompromat (compromising material) regarding his sexual activities. That in James Clapper's words, Trump is a "Russian asset" serving Vladimir Putin. Trump has repeatedly said that he has had nothing to do with Russia. But at the end of his book, Unger identifies fifty-nine Trump connections to Russia. And Unger details the actions of these Russian connections throughout the book. After reading this book, and reviewing the sources and documentation cited, I have to wonder why Trump was never charged with anything in his forty years of doing business with the Russians––money laundering for sure; a likely reason why he refuses to release his tax returns. I am astounded by Trump's brazenness: that he believes anything he does or has done is above the law. I am confident, however, that all will be revealed when Mueller completes his investigation, and Donald Trump will finally pay the piper. Here's my review of the first of the three books about Trump that I acquired this year, Fire and Fury: Inside the Trump White House by Michael Wolff. I am currently reading Fear: Trump in the White House by Bob Woodward. It was no accident that Fear was published on the anniversary of 9/11. Americans do need to be afraid.